The mindful movement , which offers training to everyone in the Kenyan Prison services. 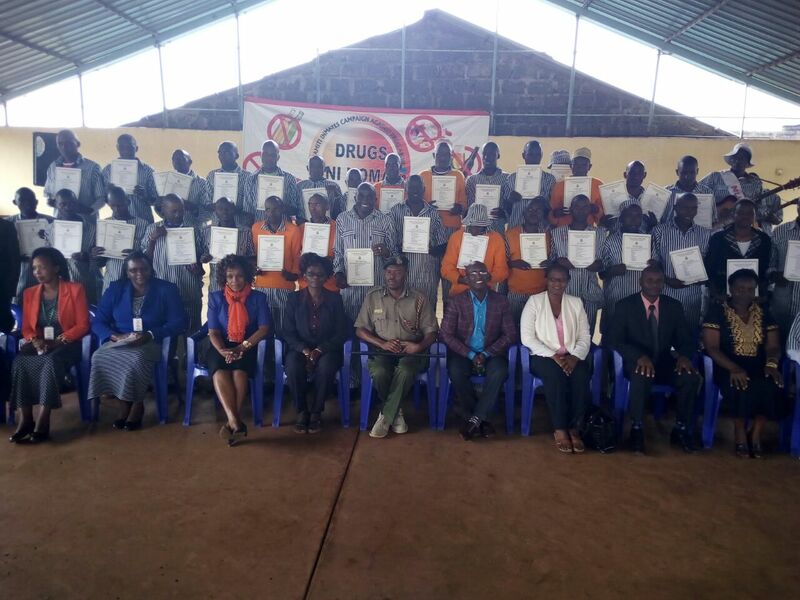 Fast forward 3 years and we have an international network of supporters, dedicated to driving this project to reach all inmates in Kenyan prisons. Do you wish to join us? In 2015 Dr Inma and her dedicated team created a Mindfulness Handbook – a training programme that guided inmates through the skills of mindfulness, empowering them to face and own their emotions and their lives, to regain hope and plan for the future – as well as Mindfuness practices which enable them to release emotions, a struggle for many. These skills and techniques are not only for their own lives, but also to teach others in the prisons, whether in their wards (cells at night) or within the prison schools. They become Mindful Leaders. This project is a true example of rehabilitation. How do we know? Since the original handbook was made, the Mindful Leaders have developed these handbooks – adding to the Mindfulness techniques, creating versions in Ki-swahili, and soon also in sign language and other of creative media in order to teach Mindfulness techniques to fellow inmates. Moreover, the ripple-effect has and is happening – families of the inmates are benefiting from this learning, families who were fractured are being healed, children are being taught too. We need your help to fund the resources needed in this work – to keep this project alive. In addition to money this project will also benefit from other resources and support. It could be something material, time, expertise, advice or knowledge, everything helps! Please do contact us if you would like to offer anything. Currently resources are at a bare minimum: some of our prisons have just 1 or a few Mindfulness Handbooks for the Mindful Leaders (inmates and Welfare Officers) to teach others. This makes it very challenging to include a large number of learners and is a barrier that prevents them from dedicating time and creativity to make the project accessible to even more people. Short supply of handbooks was a problem in all the prisons I visited during April 2018. There are between 50,000 and 60,000 inmates in Kenyan Prisons at any time, our vision for this project is to reach ALL INMATES. Currently, we estimate there is just 1 handbook for every 10 inmates who have begun Mindfulness training - and ideally each Mindful learner can use a handbook as a workbook with space for self-reflection and personal growth, something they can own, refer to, and use to deepen their understanding of Mindfulness. As well as handbooks, Mindful Leaders and trainees need paper and pens (at the very least) to demonstrate, express and illustrate Mindfulness, make notes and reflect. 57p = 80 Kenyan shillings - buys a note book and pen, this could provide a Mindful Trainee the space to reflect, journal and be creative with their mindful living. The prisons already have created songs, dramas, poems, artworks. We (including you!!) can help the project to record these creations by the Mindful Leaders, share them between the prisons and spread the teachings. Are you feeling inspired ? We love what is happening and the passion behind this project, from the Mindful leaders, staff, and communities that believe in it. We would love you to join us – be part of this global team!